The humble termite only has its body, saliva and some soil to work with, and the only blueprints it has are instinctual, based on variations in wind speeds and fluctuations in temperature as the sun rises and sets. Working with such limited resources, they still erect monumental mounds that, a new study reveals, rely on a surprisingly well-tuned mechanism for efficient ventilation, something architects today still struggle with. Led by L. Mahadevan, Lola England de Valpine Professor of Applied Mathematics, of Organismic and Evolutionary Biology, and of Physics, a team of researchers that included Hunter King, a post-doctoral fellow and Samuel Ocko, a graduate student, both in the Mahadevan lab, has for the first time has described in detail how termite mounds are ventilated. The study reveals that the structures act akin to a lung, inhaling and exhaling once a day as they are heated and cooled. 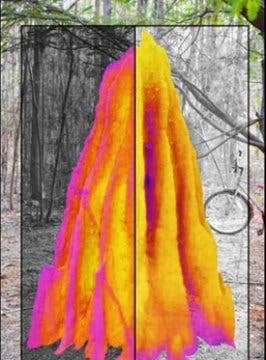 Thermal images superposed on a photograph of a termite mound (photo 1). At night (left side) the flutes are cooler, so the air first moves down them and then up the central core. During the daytime (right), the warmer air reverses the process, moving air up the flutes and then down the central core. Occurring once a day, it allows CO2 from deep inside the mound to surface and diffuse through the porous walls (photo 2). Thus the mound works like a slowly breathing lung, powered by daily temperature oscillations. The study is described in an August 31 paper in the Proceedings of the National Academy of Sciences (USA). On a trip to the National Center for Biological Sciences in India five years ago, Mahadevan was surprised to learn that many of the theories about how exactly the termites’ mounds function had not been rigorously tested. Working with Scott Turner, an Associate Professor at SUNY College of Environmental Science and Forestry, and author of a book that examines animal-built structures, Mahadevan, King and Ocko put together a plan to set out to find more definitive answers. Over a period of several weeks they used a series of custom designed probes to conduct a variety of tests on both live and dead mounds that included temperature readings during the day or at night, covering the mounds with tarps, blowing air over the structures and even using vacuum cleaners to test suction throughout it’s internal passages. As they found out, the ventilation mechanism is in large measure built into the mounds themselves. There is a large central chimney that spans from the gallery — the underground chamber where most of the colony lives — to the top of the mound. The interior, structural walls that make up the core of the mound are larger, bulkier and more resilient, but the exterior ones are far thinner. While impermeable to winds, these outer walls allow for an exchange of gasses with the environment. 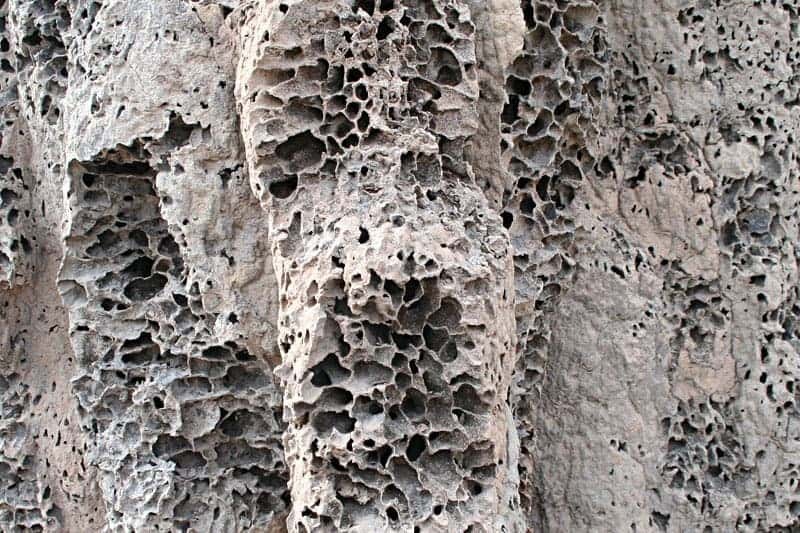 The interior structure of a termite mound. During the day, Mahadevan explained, as sunlight either directly or indirectly warms the mound’s outer walls, the air inside warms, causing it to rise. The end result is that while CO2 concentrations during the day can reach up to four or five percent in the center of the mound, the airflow at night pulls the gas to the exterior walls, where it can escape by diffusing through the wall. “But what’s remarkable here is how the termites are using transients. The temperature outside the mound is oscillating, and they have developed a method to harness that to ventilate their mounds.” Mahadevan said. While the study reveals for the first time how termite mounds truly work, it may also offer lessons human architects could benefit from. While the notion of designing buildings that can be more efficiently ventilated is not new, the principles described in the study might offer new ways to think about such passive ventilation systems.